After several successful years of improving the quality of coaching youth baseball locally and nationally, DNA Sports is now training youth basketball coaches in the importance of both individual performance and the understanding of team play in the development of youth basketball players. Too often we see youth coaches (not just youth basketball coaches) who focus only on winning games. That should be the last priority of youth coaches. We're also tired of seeing sixth grade games where the final score is 10 to 8. 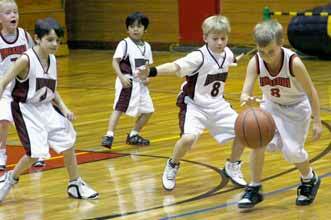 In youth basketball games, scores are low as a result of basketball coaches not effectively teaching shooting and passing skills. The DNA Sports' Basketball Coaching Clinics teach basketball coaches how to develop their athletes’ skills. We focus on how basketball coaches can structure their programs around teaching fundamentals, rather than teaching specific offenses and defenses (we’ll still have some advice on these). We also provide advice on how to effectively communicate with youth athletes so they can maximize their innate talent, understand various roles on their teams, and become productive and positive contributors to their programs. Hi kids, I’m Basketball Head! I promise that I will try to help you shoot the ball better than you ever have. And I’ll make it so much fun to practice that you will want to do it on your own. Don’t get discouraged if you don’t score immediately. The correct fundamentals always feel weird at ﬁrst. It takes hard work to master the right shooting skills that will hold up under game situations. But eventually you will get positive results, which means more baskets! The purpose of this book is to make kids’ shot technique game sound which means that their shooting form will be sound even under game speed pressure (e.g., the opponent’s defense, the speed of the game or shooting free throws when they are tired). And that is a challenge because every player reacts differently in game situations. But if kids follow all our skill breakdowns, they can achieve a game-sound shot. Digital download only. After purchasing the manual, you will receive a link to download the complete manual.